Whenever an author passes away, I'm reminded of the Library of Dream, from Sandman. There, all the world's books that were never written, except in dreams, live. This hit me especially hard with the death of Brian Jacques, author of the Redwall series. In that moment, all the possible adventures of the mice of Redwall were subtly shifted to Dream's library. The same may happen all too soon, to another grandmaster of fantasy, Terry Pratchett. Ever so often, though, readers are granted a reprieve and a tale or two appear. 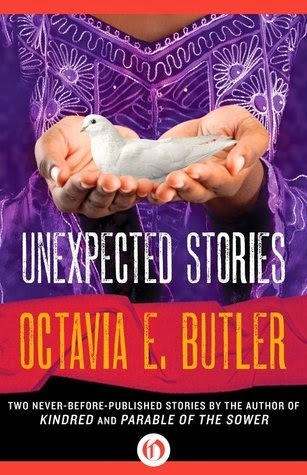 In Unexpected Stories by Octavia E. Butler, we get two stories that have never been printed anywhere before. 'A Necessary Being' is in the point of view of the leaders of two tribes. Tahneh, the Rohkohn Hao, is the daughter of the previous leader. Before him their tribe didn't have a Hao, a born leader with a pure-blue coloring. He was kidnapped from another tribe and crippled to ensure he couldn't flee. He was able to rise above the bitterness and hatred of those who had damaged him so and become a good leader for his new Tribe, but watching him and his broken legs showed Tahneh the true cruelty of that tradition. Tahneh has failed to give birth to a successor Hao, and now it's become her burden to order the capture of a foreign Hao to take over after her. Will she lose heart and betray her own tribe, or will she be able to do to the Tehkohn Hao what was done to her own father? 'Childfinder' takes place in a possible future of our own civilization. Psionic ability has appeared in humanity, and the optimists marveled at the possibilities of uniting the world. Barbara is living the reality of this new world. Hiding in a suburb-turned-slumlord-housing, she is trying to pass on the control of the psionic ability to children who would never have the opportunity for training otherwise. Very few people can see the potential for psionics in children, and it withers from disuse so quickly that most never learn to use it. Children that the organization hadn't already gotten a hold of and tainted. Children like her. The organization that she escaped from has no one else with this talent. Eve is sent to retrieve her, to find more children for their own use. But Barbara has other plans. These stories are from earlier in Butler's writing career, and it shows. These two stories show the potential that Butler has as an author, along with the rough edges that any new author has. Her ideas are as huge as in her later novels, but seem incomplete somehow. There are just a few more unanswered questions than she might have left later on, but they are still light-years ahead of the average short story. Unexpected Stories gives Butler's fans one last glimpse into tales rescued from Dream's library. Highs: The footnote at the end of 'Childfinder' is one of the most chilling bits of writing I've read in a long time. Lows: The slow discovery of the caste system in 'A Necessary Being' might be frustrating to readers unaccustomed to the style. Verdict: These two tales raise hopes that more spectacular stories might be hiding somewhere in Butler's papers, just waiting to be revealed.